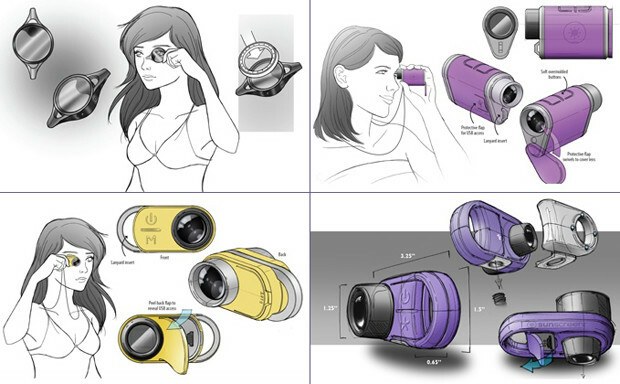 CHAPEL HILL, N.C. -- Two-time IDEA Award winner Trig Innovation, a North Carolina-based virtual firm working at the intersection of innovation, design, and marketing, has earned a 2017 IDEA Award from the Industrial Designers Society of America for its work on Sunscreenr. Created by North Carolina entrepreneurs David Cohen and Jon Meyer, Sunscreenr is an outdoor camera that aids in the application of sunscreen by making the invisible visible. Sunscreenr’s camera displays and records video of people after applying sunscreen. The device displays video through a proprietary lens that filters UV light, revealing where users may have under-applied sunscreen or had it wash away with sweat or water exposure during swimming. To reach the breakthrough design of Sunscreenr, the team visualized the user scenario first, letting people's behaviors in sunny environments tell the story of a device that would perform in that dynamic without being a hindrance. The team then dealt with critical features and the constraints raised by the size of the device’s internal components. For users to really adapt Sunscreenr as a safety device compatible for a wide array of outdoor activities, the device had to be small and lightweight enough to carry alongside a bottle of sunscreen. The Industrial Designers Society of America will announce the winners of the 2017 IDEA Awards in August. IDEA is a premier international design competition, recognizing and promoting excellence across a wide array of industries and disciplines, including commercial products, entertainment, home goods, social impact designs and student designs. Gold Silver and Bronze winners are recognized. Winning entries receive worldwide press and are housed in a permanent collection at the Henry Ford Museum of American Innovation. Now in its tenth year, Trig Innovation is focused on excellence in innovation, design, and marketing services for entrepreneurs and product development teams around the world. Based in Chapel Hill, North Carolina, Trig offers services ranging from design-for-manufacturing to virtual ideation and marketing automation.